Indochino added another blazer today - the Ultimate Navy Blue Blazer. 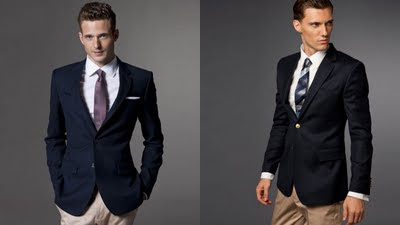 It can of course just be a coincidence, but just recently someone on Indochino's Facebook wall asked for a Navy Blue Blazer without the golden buttons - so it seems as if they saw a market there. I'm sure there is a market for it - it's a versatile piece. I remember I once used to think that only weird people wear blazers and trousers in different colours, but clearly, I was very ignorant then. I'm positively surprised about the price, by the way - 199$ is very affordable, probably making this a big seller - I assume even without a coupon (and you can see how much a coupon would be needed in the poll on the right). The info about the fabric quality is not very detailed; it is called a "solid wool blend" - of course, this doesn't tell us if it's blended with silk, polyester or any other fabric. Considering the price, I would suspect polyester (also they would mention it if it's silk or any other seemingly high-quality fabric), but that is just my personal guess. The other Navy Blue Blazer is described as a "wool blend" too, if anyone owns it, would be cool to find out what you think about the fabric. Doing my usual research on Twitter, I also found out that we should get some new shirts next - gingham shirts. Will keep you updated as usual! How about some linen suits, Indochino?